My job as a site interpreter is to guide guests from all over the country and the world around our site. I educate and inform them about the Cold War and the strategic importance of our site. 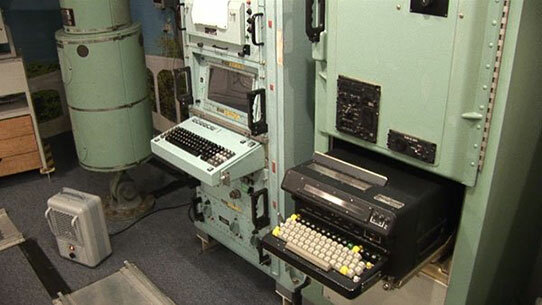 I take guests around the topside support building and also down fifty feet below ground into the Launch Control Center where missile crews stayed on alert and were ready and willing to launch missiles. I also take them into the Launch Control Equipment Building (LCEB) and show them the “life support” of the Launch Control Center. What are our visitors like? Who are they? Our visitors are awesome. People come from all over to take our guided tours. We have a lot of visitors from the local area; people from Cooperstown often bring their families and friends to visit us. Former missileer and topside personnel also visit us on a regular basis to reminisce and show their families what they did when they worked here. We also get people from all 50 states and from all over the world. This summer season alone I have given tours to people visiting from France, India, New Zealand, England, and Germany. There is no specific age range that comes through our site either. We have a kids program to inform and entertain kids and we also give tours that engage all age groups at the same time. How do you learn to give a good tour? What are some of the challenges of giving tours? Is talking about nuclear weapons sometimes difficult? Yes. Sometimes when I talk about the ranks of the people who worked down below (Captain, 1st and 2nd Lieutenant) they are kind of shocked. The ranks were not very high and the people who worked down there were usually young and not paid extremely well. When I explain that our missiles were about 27 times more powerful than the atom bomb, people are shocked. Another fact that is hard to talk about is how expendable the people who worked here were. The people who worked topside were not allowed to go below. Since the site was a direct target for a missile they would not survive a hit. The people below ground were young, had relatively low ranks and were not highly paid so if the thick concrete walls and blast doors did not work, they were also expendable. A lot of people have to take a moment to wrap their minds around those tough truths. What do you hope visitors are learning when they visit RRMMSHS? I hope that our visitors can see how important these sites were and appreciate the men and women who helped operate them. I hope they can connect the history of this site with what is going on today, as the U.S. is involved in many nuclear issues right now. I can’t name one specific reason. I love history, so working at a historic site is a dream come true. I love the people I work with; we all work together and get along so well. I love the visitors that come out and support this place. I am a people person so meeting new people from all over the world is a ton of fun. I also love making sure people smile and enjoy my tours while learning about the site. It’s just a great job no matter how you look at it. What have you learned by working at RRMMSHS? I have learned so much about nuclear weapons, the Air Force, the history of the area and the people who worked here. I learned how to connect with people and educate them. I’ve learned so much that I can’t list everything! What are your future career goals and how do they fit in with working at RRMMSHS? I am currently working on my B.S. in Recreation and Tourism Studies and I hope to help run, preserve and interpret many other historic sites throughout the U.S. or the world. Working at RRMMSHS is a great example of how bringing history back to life can influence people and local tourism. It is also a great example of teamwork and effort because the State Historical Society and our local supporters worked so hard and put so much time and effort into this site. Without both parties’ help, this site would not be what it is today. Why isn’t it special?! It gives people a close-up look at a once top secret facility that once controlled weapons of mass destruction. You can’t get much more amazing and special than that.